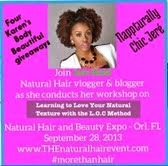 Nappturally Chic Jeré: Sunday Chic Edition!! One of the purposes of this blog is to highlight beauty in all the many places that I see it! 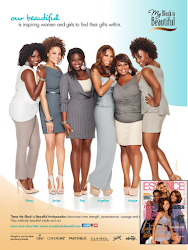 The special thing about beauty is that it comes in all shapes, sizes, colors, and age! 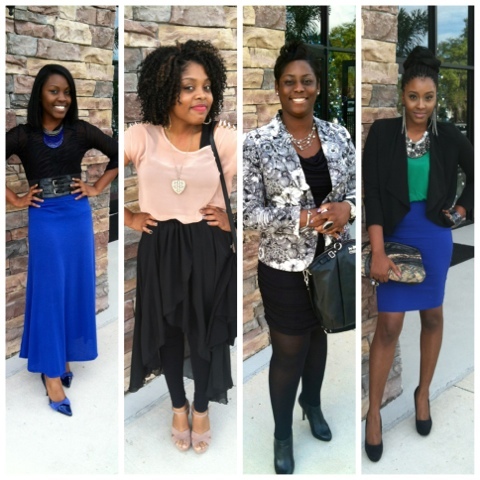 Today I found some beautiful people in their Sunday Best for my very first Sunday Chic Edition. The people that are highlighted today aren't just beautiful and chic because they all look the same, or because they are dressed in a particular way. 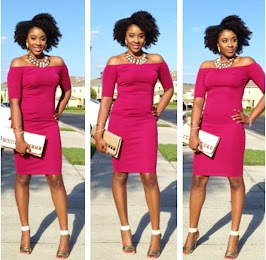 They are beautiful and chic because they exude confidence and aren't afraid to showcase their own personal style in their own unique way! 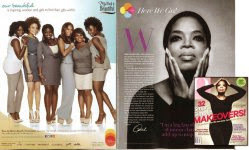 I Love celebrating beauty: the inner that amplifies the outer and the style that brings it all together. I'm rocking a color blocked outfit. 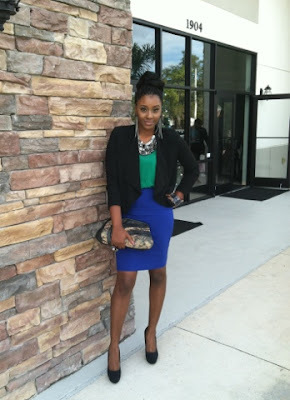 I paired my cobalt blue pencil skirt with a green silk top and a black shrug. I found this clutch in my grandmother's closet and it is about 25 years old but so fabulous and chic!! 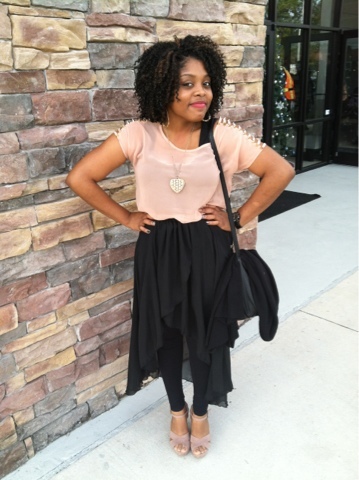 Shorna looks amazing in this spiked embellished blouse and black Tulip skirt. I love her unique choices with the matching sandals and gold accessories. 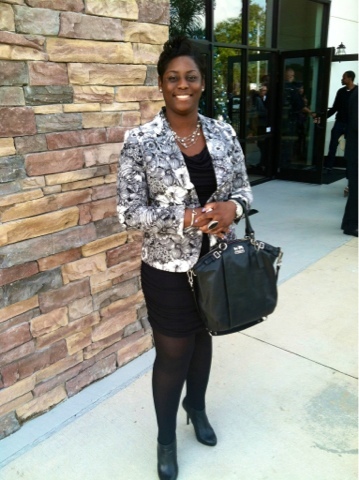 Sharie looks amazing in this black and white print Blazer paired with this fitted black dress. Her tights and booties are the perfect addition to this look. Jamila is rocking this cobalt blue!! I love how this skirt elongates her frame!! Did you notice those shoes?? They are the perfect addition to this whole look. Dana is rocking a cute color blocked outfit. 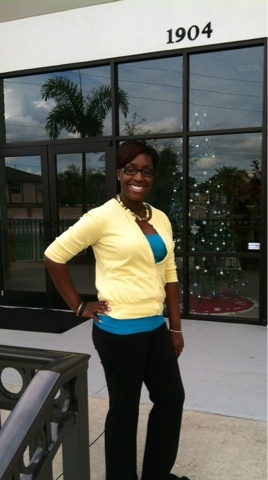 I love how she put this bright yellow and teal together!! So cute!!! 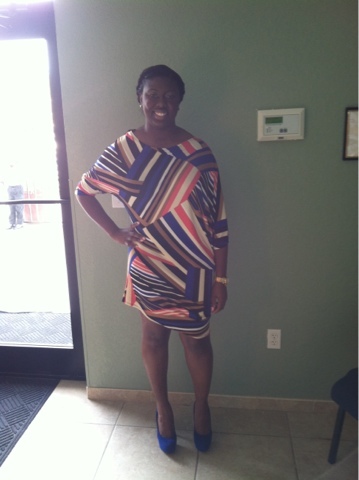 I love the way Geline is rocking this pattern dress. 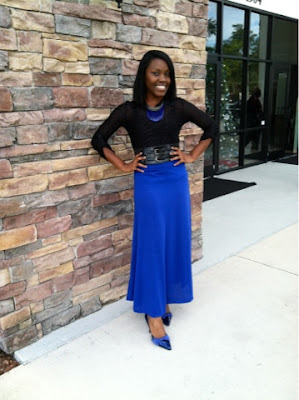 I especially love the way she accentuates this dress with these cobalt blue pumps. Very Chic! !